1. Combine all ingredients and let marinate in refrigerator for 30 minutes to 1 hour. 3. Place on grill and cook for 5 minutes or until done. Turn halfway through cooking time. Use the larger sea scallops rather than the small bay scallops when grilling. 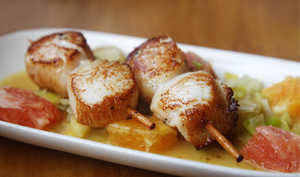 Because of their size, bay scallops can be hard to thread on a skewer. If raw ginger is on hand, 2 tsp. of grated raw ginger can be substituted for the 1/2 tsp. of ground ginger. Visit www.foodsafety.gov for more information on safely cooking seafood. *Recipe provided by Hamilton Beach.